I can scarcely believe what happened earlier tonight, Constant Readers. 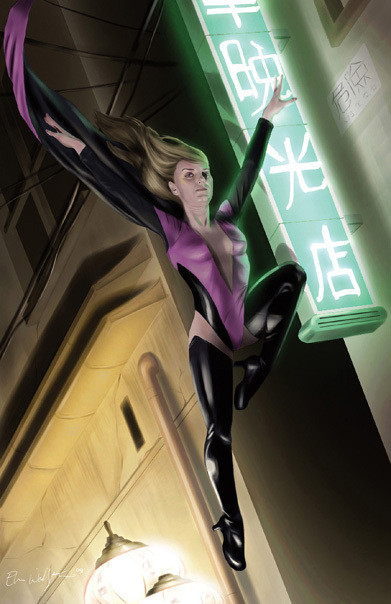 If you weren’t too busy at Comic-Con yesterday to check your Twitter feed, you know that I was approached by an anonymous source here in San Diego who claims to have been paid by Mason International to design a spandex superhero costume for a petite blonde woman. Naturally, we at the Flashlight assumed this costume was meant for the long-missing Sara Ward, the frontrunner for Mason International’s alleged superhero bodyguard position. Our informant, who shall remain nameless, did not cover his tracks very well, and we traced his IP address to a local San Diego company, Myriad Design. And unfortunately for him, we weren’t the only ones. Our nameless informant, it seemed, shared our mistrust of Mason International, and was willing to hand off copies of this alleged concept art, but only to me, and only if I came alone. My stalwart companions RoboVamp2000 and RealJackBower were suspect of this arrangement, but something about my informant’s e-mails rang true. We arranged a meet, and our informant was true to his word. The nervous man approached me in dark sunglasses and a black hoodie, and handed me a sealed envelope filled with the original hard copies of the sketches, as well as copies of his invoices to Mason International. I tried to press him for information, but he promptly took off. If he hadn’t, they probably would have gotten us both. All of a sudden, a black SUV screeched to a halt in front of our fleeing informant. A half dozen goons (who I can only assume work for Mason International) jumped out of the vehicle and pulled him inside. Then they turned their attentions to me. I did not stick around long enough to get their license plate. Through pure dumb luck, I was able to lose myself in the Comic-Con crowds. Suffice it to say, after that, I got the hell out of San Diego in a hurry. Greetings, Constant Readers! I’ve been getting some questions about the “666” appended to the end of my twitter handle, so I thought it was about time I posted an explanation. The “666” is not, in fact, a pledge of allegiance to the Biblical Beast, though I can see why so many would make that mistake. No, the reason I added “666” (aside from the fact that “Uroboros” was already taken) is because that particular numeral is ubiquitous in the world government’s every attempt to see us pushed, filed, stamped, indexed, briefed, debriefed and numbered. Each set of lines in the barcode stands for a number 1-9, so that for instance a skinny line next to a fat line might mean 1, a medium line next to a fat one 2, and so on. The code for 6 is two skinny lines next to one another. Notice every barcode has three sets of thin, parallel lines slightly longer than the others at the beginning, middle and end. These particular lines register as void because they are barriers, but by being two thin lines, they encode the UPC number 6 thrice. Also notice there are always 13 numbers displayed beneath the barcode. Every person in the world has been assigned an 18 digit tracking number, which consists of 3 groups of 6 numbers. The first 3 numbers assigned in the BEAST computer to everyone are 666. The next is one’s national code. The U.S. national code is 110. Then the next 3 numbers are your telephone area code, and then finally your 9 digit Social Security number. The code then is 666 + Nation code + Tel. area code + social security no. = BEAST I.D. no. for an individual. Now we at the Flashlight have been known to balk at the Judeo-Christian model of the universe, and as far as we’re concerned, the jury’s still out on the existence of Satan as the incarnation of evil itself. We don’t need the influence of an all-powerful fallen angel to explain the evil that men do, we know that the potential for said evil exists deep down inside of all of us. But whether or not there is a devil incarnate, and whether or not he/she/it is behind this monstrous supercomputer in Belgium, is not the point. The point is this: the tagging has already begun. “666” are the first three numbers in the 18-digit identification code of each and every one of us. “666” is encoded into every UPC bar code in the country. And with the government already making Veri-chips mandatory for pets, criminals and alzheimer’s patients, how long do we have before they subject us, the general public, to this same indignity? How long before the Brotherhood international bankers use these microchips to make good their long-threatened world cashless society and put all of us under Big Brother’s thumb for good? So before we find ourselves forcibly branded by our fascist, consumer-driven society, I urge those of us who see the writing on the wall to brand ourselves preemptively. If you agree with the Flashlight’s ends, add the numbers “666” to the end of your Twitter handle. Let them know that we know what they’re doing, and that we aren’t going to stand for it. Illuminators: for those of you who missed it, last week we hacked into the @mason_intl Twitter account, in hopes of uncovering evidence that would definitively prove their involvement in illegal activities. Then, this past Monday, I took what amounts to a disappointing misstep. I changed their password and hijacked the feed, posting status updates which I hoped would turn the public against Max Mason and his evil corporate agenda. Everyone assumed Fury of Solace was to blame, and he proceeded to lambast our efforts but good. And I hate to admit it, but he was right. If I had laid low, I could have used the account to gain further intel overtime. Instead, Mason International’s techs regained control, deleted my posts, and shored up their account so it’s all but impenetrable now. But we did not come away from this completely empty handed. Through laziness or overconfidence, Mason (or more likely one of his cronies) left a digital trail of Direct Messages connecting them to criminal acts which we at the Flashlight had previously attributed to the criminal kingpin called King. This has broadened our understanding of Mason International’s misdeeds, and provides us with a new jumping off point for future investigations. If you loyal readers get any more tips about the machinations of King, Mason International or both, please drop us a line! 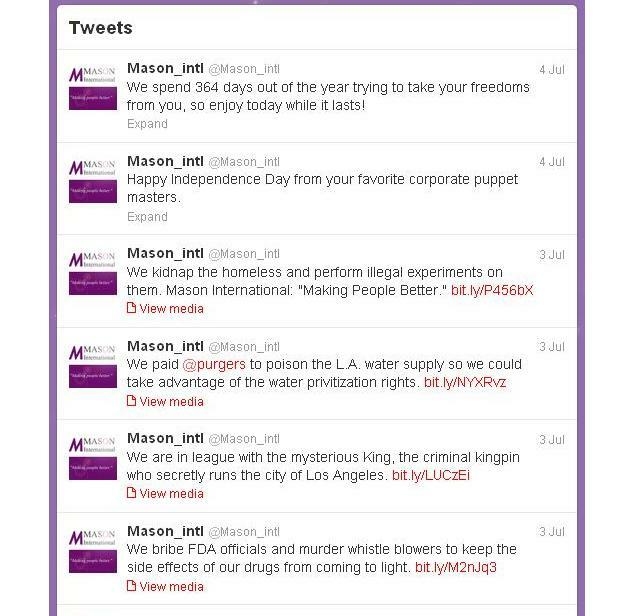 Oh, and for those of you who missed it, I grabbed this screen cap of our fake @mason_intl Twitter updates before the pharmaceutical company was able to purge them from the site. Enjoy! Constant Readers, in a turn of events almost too convenient for even us to believe, it appears that two lines of Flashlight inquiry are beginning to converge. And the implications are downright terrifying. In our continuing attempts to undermine the efforts of pharmaceutical giant Mason International, we have most recently hacked their corporate Twitter account. There, we found Direct Message exchanges between the pharmaceutical company and groups known to be pawns of another thorn in L.A.’s side, the mysterious crimelord called King. Cryptic exchanges with groups like the Purgers, key figures in the L.A. river poisoning and the subsequent water privitization scandal, while not in and of themselves incriminating, certainly paint a picture making a connection between the world’s biggest pharmaceutical company and the city’s biggest crime lord hard to deny. And if we’re right about this, it also implicates Mason in the Skid Row Homeless experiments and countless other despicable acts.